JVC-GRAPPA creates additional channels by treating data from other echoes/cycles as extra coils. A potential exciting outcome of this method is in single-shot and/or multi-shot diffusion imaging where the acquisition time could be substantially reduced. We sat down with Kawin Setsompop and Berkin Bilgic from A. A. Martinos Center for Biomedical Imaging, and their collaborators Justin Haldar and Tae Kim from the University of Southern California, to discuss their paper, which is this month’s Editor’s Pick. MRMH: Kawin, you’re no stranger to MRM Highlights. You produced the most cited MRM paper of 2012, on simultaneous multi-slice imaging (SMS), and you’ve also featured in our magazines with your researcher profile and the g-slider method. We’d like to know something about the background of the other members of this collaboration. Berkin, how did you start doing MR research? Berkin: Before coming to Martinos I was at MIT doing a Masters in Computer Vision, and then I joined Elfar Adalsteinsson’s lab. After finishing my PhD I joined Kawin’s lab at Martinos, and now I am an instructor in Radiology there. Justin: I was an undergraduate student at the University of Illinois. I knew I liked signal processing and that I wanted to go to grad school, but that was about it! It was a great break for me when Zhi-Pei Liang asked if I would like to work on MRI. Of course, it didn’t hurt that Paul Lauterbur, a good friend and collaborator of Zhi-Pei, had just won the Nobel Prize. Everything came together and I’ve been in the field ever since. MRMH: So did you get to work with Dr Lauterbur? Justin: Paul had moved out of MRI at that stage, but I saw him around quite a bit. I was there for all the Nobel Prize celebrations but didn’t work on the technical aspects with him. MRMH: How about you, Tae, how did you get started with MRI? Tae: I did my Bachelor’s in Electrical Engineering in South Korea. When I applied for an imaging program I realised that MR reconstruction fits perfectly with my interests. So I ended up coming to USC where I met Justin. MRMH: Kawin, can you tell us how this collaboration between Martinos and USC came about? Kawin: A few years back I was reading one of Justin’s papers on constrained reconstruction. I was impressed by his work and felt I wanted to collaborate with him. 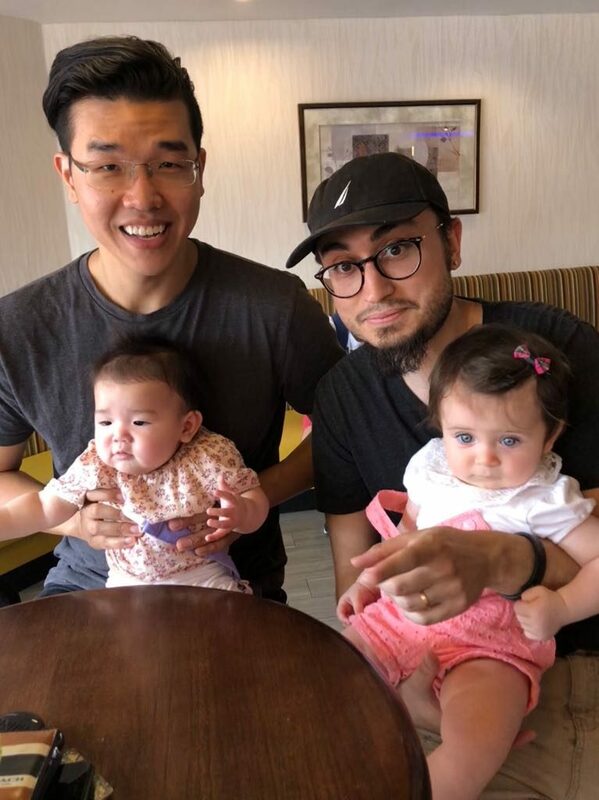 At the ISMRM meeting in Toronto, we went for brunch and started talking about a collaboration. MRMH: So, networking at breakfast, lunch and dinner at these conferences really pays off…. Kawin: (laughs) It’s always important to have a face-to-face chat to establish a rapport and see what the other person is working on; most of my collaborations begin this way. MRMH: How did you come up with the concept that echoes/cycles could act as extra coils, creating more channels in the JVC-GRAPPA method? Berkin: We began by looking at balanced SSFP and phase cycling. With phase cycling you get this banding artifact that causes intensity variations in the image, both in amplitude and phase, and we thought we could convert these into additional encoding power. This joint-GRAPPA reconstruction worked well, and we began to realize the approach would also work for multi-echo, multi-contrast reconstruction. Subsequently, though, we found a paper about the TIAMO method and realized that the idea was actually 10 years old. MRMH: Was it disappointing to realize that somebody else had already had the idea, or did you feel vindicated by this discovery ? Berkin: Our approach was a bit different – we were looking to go faster, whereas they wanted to compensate for the difficulties encountered at 7 T.
Justin: When Berkin showed me that others had already explored this idea, I felt a little disappointed that there was already a precedent. MRMH: Did you find that there were technological constraints or challenges associated with the JVC-GRAPPA method? Berkin: One issue is reconstruction time because in these GRAPPA-like k-space domain techniques, this usually scales with the square of the number of coils, and since we synthetically increase our number of channels, the reconstruction time increases. But I’m not too worried about this because every couple of years computers get faster. Tae: Memory may be another issue, especially with 3D images, if we use a lot of echoes. 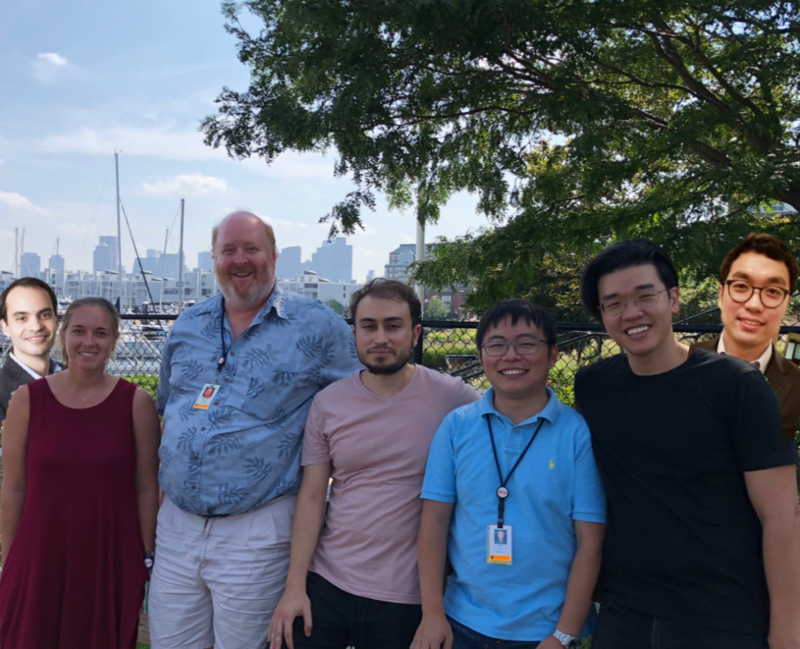 Justin Haldar, Mary Kate Manhard, Larry Wald, Berkin Bilgic, Congyu Liao, Kawin Setsompop, Tae Hyung Kim (from left to right) in Charlestown Navy Yard. MRMH: Do you see the potential of machine learning for further improving the reconstruction? Berkin: Generally speaking, we’re a bit concerned about this black box application of machine learning, as we see machine learning as complementary to what we do conventionally with physics-based hardware encoding. We try to use it to give us some sort of initial clue to help us approach very difficult non-convex joint reconstruction problems. By using it solely in our initial approach to these problems, we are more resilient against generalization issues. Tae: Conventional reconstruction techniques such as GRAPPA are also classified as machine learning, but the difference between conventional and modern methods is that today we learn about prediction relationships from another data set as opposed to the same data. This is a potential major pitfall of the machine learning approach. It isn’t such a problem in phase detection, but in medical imaging we should be very cautious. MRMH: How is this body of work going to develop and branch out? Kawin: Our aim is to do this multi-shot, multi-contrast imaging well using different reconstruction methods, constrained reconstruction and machine learning. Justin: There are lots of important practical things we can do with these techniques, but the thing is that advanced reconstruction requires you to make a number of assumptions when formulating the problem. What happens if these are not true? What will cause the method to fail, and if so, how? Will you end up inappropriately reconstructing a tumor, or the absence of a tumor? We currently have good empirical evidence that things are robust and working well, but it would be nice to have confirmation of that at a deeper level. Ultimately, what matters is accuracy and seeing in an image what is really there in the subject. MRMH: This collaboration seems to have gone really well but you are all based in different places. Have you had a chance to celebrate?! Kawin: We Skype from time to time and meet at ISMRM. Justin has been particularly busy because he just got tenure, but we hope to meet up at some point soon and grab a beer. MRMH: Definitely more than a beer… champagne? We could perhaps arrange it for the Highlights party in Montreal! Kawin: Yes, that would be great!